I was undecided what to make for dinner when I realized I had a half a pork loin in the freezer. We had bought a large pork loin (not pork tenderloin), cut it up and put one half in the freezer. It was probably about 3 pounds. It can be tricky to find new and exciting ways to fix pork. For me, anyway. I wanted something with very little fuss, and something that wouldn’t mean running to the store with a list of ingredients to buy. I decided to just rub it down with a little canola oil, some dried spices and throw it in a covered casserole dish and let it cook. Of course I decided on this in the late morning when I would have no time to thaw the roast out. After deciding what to dress it with, I realized I had 4 medium-sized red potatoes that were getting ready to go over to the dark side. So I scrubbed them, quartered them up and threw them in the dish, surrounding the pork loin. Then I covered it and popped it into the oven to cook. Because the roast was frozen solid I had planned on cooking it for an hour and then checking to see how it was doing. However, I got a phone call and had to run out and got delayed. Of course I forgot all about leaving the roast in the oven. As I was pulling into the driveway I remembered and thought, “Oh, crap! I bet it’s ruined!” By now this thing had cooked for a little over 2 hours! I rushed in and looked and was surprised to find it was absolutely perfect! In fact, it was so perfect it was falling apart as I was trying to cut it. Because my husband must have gravy on most of his roasts, I just used some store-bought pork gravy and it turned out great. Very easy. Very tender. Very good! Take all the dried spices and mix them together in a small bowl. Set to the side. Wash potatoes but don’t peel them. Cut each potato into even sized cubes. Place potatoes into a medium-sized bowl. Drizzle 1 tbsp. of oil over the potatoes and then take 1 tsp. of the dried spice mixture and mix it together with the potatoes. Take the additional 1 tbsp. of oil and using your hands, spread it all over the pork loin. 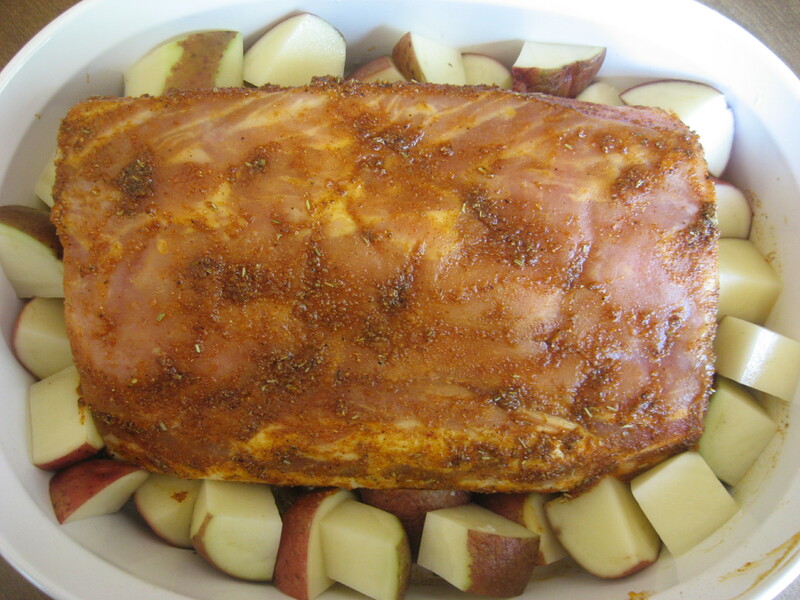 Sprinkle the remaining spice mixture over the pork loin and rub it in well, covering all sides. 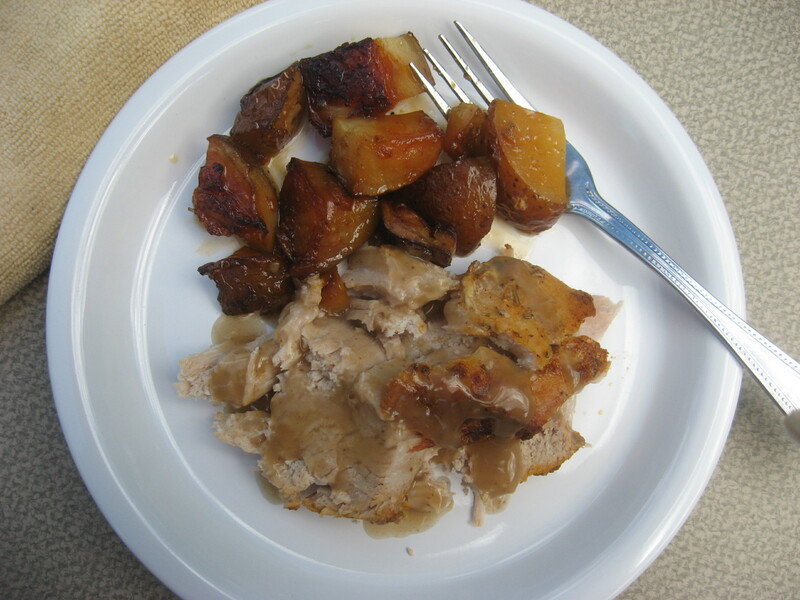 In a large baking dish with a lid, place the pork loin in the center and surround it with the potatoes. Cover it with the lid and place it on the center rack of the oven. If your roast is not frozen, give it an hour to cook and then check it. If not completely done, cover and place it back in the oven and continue to check it every 15 minutes until done. If your roast is frozen solid like mine was, I let mine go (accidently) almost two and a half hours and it still came out perfect. 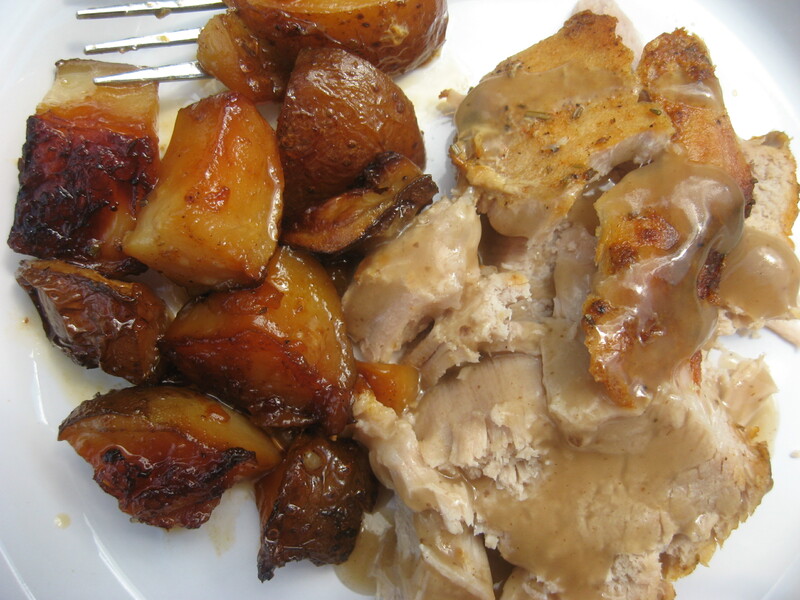 Serve this with some pork gravy and enjoy! Sounds pretty good! Nice combination of spices for flavoring. And the leftovers would make a fabulous sandwich! My husband thought the same as you and took a sandwich of this to work today on a crusty roll. I just had a purchaed premarinated pork tenderloin from Wegmans 9usually I don’t buy them like that) with Carribean seasoning and it was ridicilously delish! Now I am in the mood for pork! HA!